Hello everyone and welcome to another amazing Blog Hop here at the Really Reasonable Ribbon's Ramblings Blog! Today we are happy to have our friends from the Hampton Art Blog joining us for a special 'Choose Hope' Blog Hop for Breast Cancer Awareness. Today you will see some great projects from the RRR and Hampton Art design team girls showcasing Stamps and Inks from Hampton Art and Ribbon and Trims from Really Reasonable Ribbon. I'm sure there will be lots of very inspiring projects! 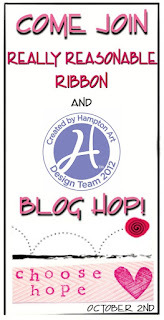 For some daily inspiration, but sure to sign up as a follower on the Hampton Art and Really Reasonable Ribbon Blogs. You will find daily posts from top notch designers showcasing a variety of styles that you just don't want to miss! I'll start you off with a card here before you begin the hop. I used the Hampton Art Blooming Memories Clear Stamp set with contains 19 stamps which are all just gorgeous!! I have 4 of the stamps on my card front. On the inside of the card on the left I have used the Hampton Art Think Pink Set. I was also able to use some of my new Spellbinder dies including the A-2 Fancy Ribbon Threader. What a fun die! I threaded 5/8" Hot Pink Checkerboard Satin through the slits for a fun look. The breast cancer awareness ribbon was made with 3/8" Pink Double-Faced Satin. 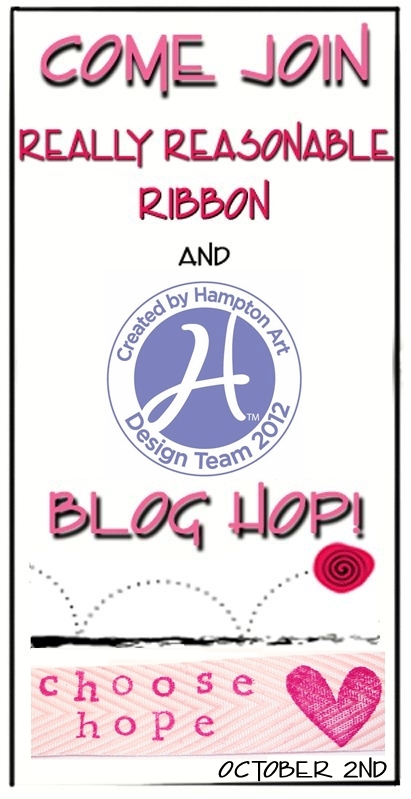 Now let's get hopping and see what the RRR and Hampton Art design team girls have created for us. If you get lost along the way, hop on back here and we'll get you back on track. We are beginning on the Hampton Art Blog and ending here on the RRR blog. This is a long hop, so if you want to do it over a few days, just mark down where you left off and head on back tomorrow to finish up. This blog hop will be open through October 9th. Here is a photo of the awesome prize offered on the Hampton Art Blog. Be sure to follow the directions on the Hampton Art Blog to be entered to win this fun prize pack! Really Reasonable Ribbon will be giving a $20 Gift Certificate to one random commenter on the RRR Blog. How can you win this fabby RRR Gift Certificate?? Become a follower. We LOVE having you come by and our followers help us out in so many ways. Grab our 'I love RRR' badge and display it on your blog (it's located near the top of the right column). Tell your friends about us and our Blog Hop. Blog about it, twitter it, facebook it or just tell a friend. If you are a woman of the correct age, have you had your mammogram this year?? If not, make your appointment TODAY! If you haven't reached that magical age yet, have you don't your self exam this month?? Our winner will be selected from the numbered comments on this post on Wednesday, 10/10 using random.org. Be sure to check back on Wednesday evening to see if you are our lucky winner. For all of our challenge lovers, we would love to have your join our current challenge with a Pretty in Pink theme. New challenges are posted on the 1st and 15th of each month. We would love to have you join in. I love your card, Bonnie! YES, I'm am of that advanced age that I get a mammogram every year. This year I got it the day before my birthday which was just last week. In fact, I've already gotten the letter from the doctor's office to say everything was normal - WOOHOO! I'd like to take a moment to remember a friend who lost her battle to OVARIAN cancer on September 20. While there is much attention given to breast cancer, little is given to ovarian cancer which is a devastating disease. My dear friend fought the good fight for 3.5 years... please remember Virginia Langford Tate in your prayers. I love your card, Bonnie - the threading of the ribbon adds such great texture!!! Thanks so much for sponsoring this hop - it's my first as a participant, and what a hop it was! Wonderful talent and inspiration along the way and I'm looking forward to using your beautiful fibers in many many more projects! Awesome card Bonnie! I love that ribbon threading die! The hop for hope was awesome and I'm so glad I could participate! Thanks so much for all your hard work - it really paid off! I'm having a blast using the ribbon you sent! Thanks so much! I had a mammogram last fall and will have another after my physical this fall. Thanks for the reminder. great hop! great cause too! Such a lovely card! I love that new Spellbinders die! So pretty! Thanks so much for this months question. As a mammographer~I really appreciate the reminder for women to do monthly self-exams and get yearly mammograms. To answer your question, Yes I had my yearly mammogram and I do monthly self-exams. Lovely card. I am a follower and yes I need to make an appointment. Thanks so much for the hop love all the pink. What a wonderful way to remind women. I had mine done last week. I'm very excited about this blog hop. I hope I win something! beautiful!! love the color combo! Gorgeous card and I love the inside sentiment and badge on the left. So Appropriate. My appts set for end of month. Never miss an annual due to family history. So thanks for the reminding everyone. I just finished the hop. Great inspiration! I'm seeing pink! what a fun blog hop with so many wonderful cards but I think my favorite card is the one on this blog. It's so elegant and I love the sentiments both inside and out. Always get a mamogram every fall. My apts is made. Love the purpose of this hop. Thanks for the terrific joint hop Bonnie! My exam is actually tomorrow believe it or not! The thought of not knowing is over whelmingly scary! The DT efforts were outstanding! My fav is te bodice and card set! Simply stunning! ps. liked FB, posted the RRR gadget and stopped in every hop. Thank you for sharing the card and yes - I have an appointment this Friday!!! Great Hop! Great card, I have seen a lot of wonderful projects on this hop. It was kind of a long hop but so inspiring, and well worth the jog. you are all so creative. Just finish hopping. I have to say that try as I may, I could not leave comments on 2 blogs: Adora and Heidi. (I tried several times). Thanks for a lovely hop. I have not made my appointment as yet, but I will soon. And I became a follower of your blog and liked you on facebook. Friends!!!! What a wonderful hop! I just lost my Mom to breast cancer and love that you are sharing the hope associated with this horrible disease! I have had my mammogram, and hope everyone does! I am a follower and am already a fan on FB! Such a pretty card. I have that Spellbinders set also, it's so pretty! Mammogram time for me is in December..."Ho, Ho, Ho ...squish"! This is beautiful and truly captures the meaning of the hop! My my what a beautiful card...inside and out! I really like how that one little blossom leaps off the page! I can't wait to see that HA stamp set! Haven't seen this SB die either! I am really missing out because that is such a unique way to display the ribbon! Just lovely! No, I'm not that age YET (won't be long LOL) but I do check myself every month. Beautiful card with the bright pink ribbon woven through the die cut! Love it! I schedule my mammo every year around my birthday. I'm 56 and never missed! Thanks for such an amazing hop! Gorgeous card!! I LOVE how you stamped the flowers!! Just finished the hop and my oh my what awesomely beautiful projects there were along the way. I'm already a follower, like you on FB, have your badge on my blog and shared your hop on FB! Thanks so much for putting this wonderful group of ladies together to share their talent! Wow...love the threaded ribbon...amazing projects!